However, its price can vary from simple to double: so several phone calls to retailers can lower the bill ! 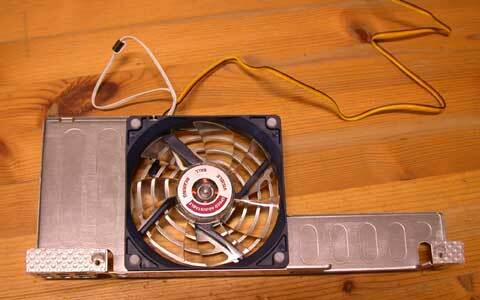 I remove the fan's support as in silence in a B/B G3 points 3, 4, 5 and 6. Before removing the culprit, I had tested the CPU temperature (ThermoInDock software for X or GaugePro for OS 9 and earlier). This temperature raised up to 40 Celsius degrees just before I operate the fan. Oncee the fan removed, I put my little home-made noise reducers. And the new beast. Power will be taken on the hard disk connector. I do not use the original screws to fix it back but I use nylon screws (thanks John): this kind of screws less transmit vibrations. I set up the potentiometer for the fan to maintain an internal temperature of 35 Celsius degrees. -> not only is this fan really noiseless but it cools the machine better than the Apple original one! So, I also shutdown my Radeon graphic card fan. Well this G4 is still noisy compared to my iBook; but now it is tolerable. As usual, follow these steps in a reverse order to rebuild the G4.